Love em!And I love that gorgeous sweater! Love everything about this…the jacket is too hot! Check out my INTERNATIONAL COASTAL SCENTS 88 Palette giveaway, if you hadn’t done so already! wish you a wonderful day, my dear. Very nice. 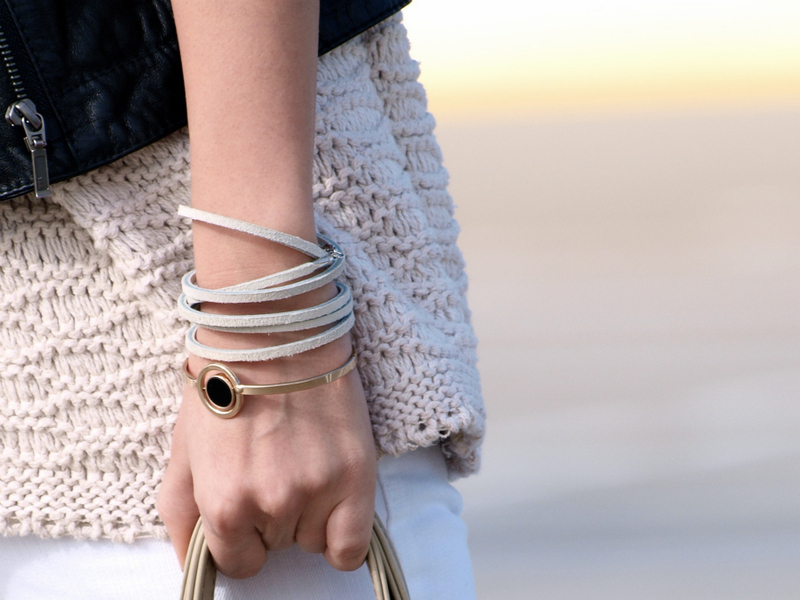 I’m liking the light neutral color palette of this outfit! Very nice look but I love your attitude! Love the boots, and the sweater too!! What a perfect look ! Everything is great. I love your jacket and your bag is so lovely. Nice sweater too. I adore that jacket! And, am maybe a bit jealous of you new boots. Love especially your sweater color! Black and white photos are gorgeous!Looove the boots! Thanks for your comment! You look very chic yourself, I like this classic and stylish outfit! Great neutral look, your’s not trivial.I like that you combine white pants and heavy aviator with beige rest of pieces on you. Looks stylish! Thanks for pass to me and for your opinion, i’m very happy about that! This post is very beautiful and your outfit are beautiful too. So simple so bloody gorgeous! Love the boots and your look as usual girl! Great boot and beautiful jacket. Your blog is lovely, if you want visit my blog and let me know if you want to follow and I will follow back. Each your outfit is perfect!BRAVO! I-mi place foarte tare!!! You look stunning! Nice choice! Subliime ! Tres joli blog aupassage , metci pour ton passagesur mon blog kises. this is simply a perfect look!! love them! they’re so gorgeous! Great new boots!!! I missed you!! I was so busy but now I´m back!!! whoa! this look is stunning! you look beautiful, i love the sweater! Thanks for the comment on my blog and come by any time, I will came again! your blog is SO gorgeous. i absolutely love your style. a pair of beige ankle boots are on my christmas list this year! The ankle boots are perfect and they go so well with this neutral palette and edgy jacket. Gorgeous look. Yeah…amazing! we’re in the same mood:) I love your new booties! Great combination of colors white+beige!!! You look sooo pretty! Love everything about this outfit!! Love love love your gorgeous jacket! You look fantastic, as usual! Great outfit! Beautiful pictures and style! Love the look… Relaxed and glamorous! I want those boots too! They are fabulous! I like that brown leather piece in a back. The crochet top and jewelry are gorgeous. You look stunning dear, love every single piece of your outfit !! Always elegant, I was a fan of your style, beautiful! Amazing look! Love that boots! You look so stylish! Btw, i love your colour hair! Love this, everything looks amazing together! I totally love taht outfit!The bag and jacket are great! love the boots but I absolutly adore your jacket! Love the jacket, you look so chic and cool. Yes Maria!!! I said the same thing when I saw them :) maybe Acne ? 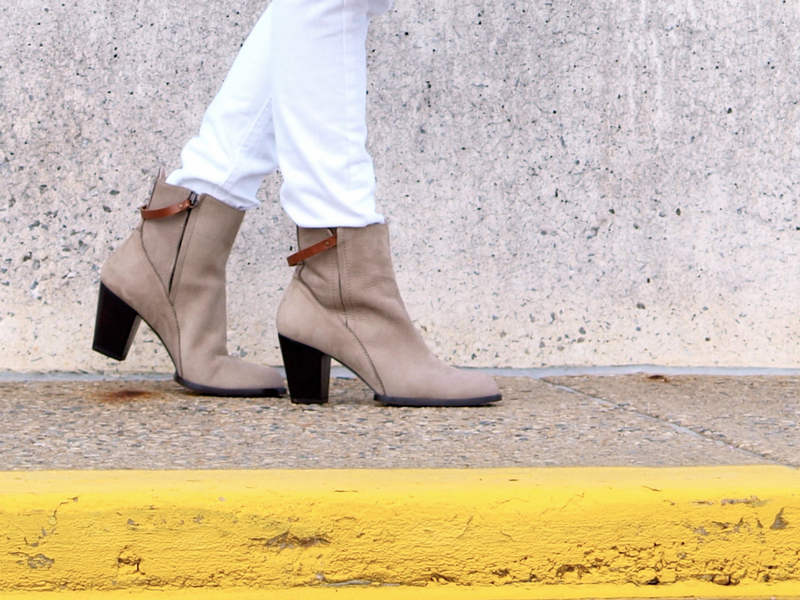 Super cute look on you and way to rock a neutral bootie! Thanks so much for stopping by my blog too! Love the neutral pallet of the outfit! I want take photos of your style. Take a look at my work and follow me if you like! You look so stunning with your hair up, just wow! I love the mix of neutrals with the black jacket and accessories, so chic!!! yes please I love the white and beige…with the leather jacket standing out. perf. I recently visited the linkage you share here and it’s actually a wonderful place for web developer and web developer new bird like me. I find the site very enlightening and worth visiting. I also love the design and the layout it carries.